Everyone is familiar with the unfortunate statistics on the prevalence of obesity among youth. Obesity affects 17% of children and adolescents in the United States (Ogden et al., 2016). Because physical-activity counseling has been identified as a critical component of weight management among children (Kist et al., 2016; Barlow et al., 2015; U.S. Preventive Services Task Force, 2010), identifying tools and strategies that effectively increase physical activity within weight-loss programs for youth has become a research priority (Flodmark, 2016). 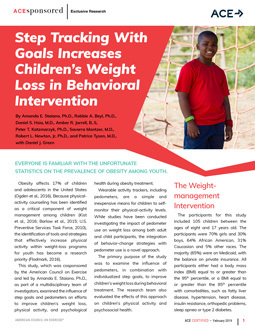 This study, which was cosponsored by the American Council on Exercise and led by Amanda E. Staiano, Ph.D., as part of a multidisciplinary team of investigators, examined the influence of step goals and pedometers on efforts to improve children’s weight loss, physical activity, and psychological health during obesity treatment. Wearable activity trackers, including pedometers, are a simple and inexpensive means for children to self-monitor their physical-activity levels. While previous studies have investigated the impact of pedometer use on weight loss among both adult and child participants, the integration of behavior-change strategies with pedometer use is a novel approach. The primary purpose of this study was to examine the influence of pedometers, in combination with individualized step goals, to improve children’s weight loss during behavioral treatment. The research team also evaluated the effects of this approach on children’s physical activity and psychosocial health. The participants for this study included 105 children between the ages of eight and 17 years old. The participants were 70% girls and 30% boys, 64% African American, 31% Caucasian and 5% other races. The majority (65%) were on Medicaid, with the balance on private insurance. All participants either had a body mass index (BMI) equal to or greater than the 95th percentile, or a BMI equal to or greater than the 85th percentile with comorbidities, such as fatty liver disease, hypertension, heart disease, insulin resistance, orthopedic problems, sleep apnea or type 2 diabetes. The weight-management intervention, called “Our Lifestyles, Our Lives,” consisted of a series of 10 weekly 90-minute group sessions focused on physical activity, nutrition and behavior modification. Participants’ parents and siblings were encouraged to attend all sessions, which included eight sessions held at the research facility as well as one session at a local grocery store and another at a quick-service restaurant. The multidisciplinary staff leading the sessions included a pediatric gastroenterologist, pediatricians, a clinical psychologist, a dietitian and kinesiology-trained fitness specialists. According to Dr. Staiano, this multidisciplinary approach was essential, not only because it kept the children and their families engaged, but also because the American Medical Association and American Academy of Pediatrics both recommend such an approach when treating obesity. The sessions were interactive and included cooking demonstrations, light-to-moderate physical activity for the children and their family members, and behavioral counseling in both mixed (parent and child) and parent-only formats (Table 1). In addition, all participants received a 72-page program guide that included weekly goal sheets and healthy recipes. The goal sheets were completed by the family and included a nutrition goal, tracking of daily water consumption, minute-goals for physical activity, pedometer step goals (if applicable) and space to create self-selected behavioral goals. Finally, all participants received incentive items—low-cost items like bouncing balls, jump ropes, water bottles and nail polish—throughout the program to reward and encourage participation, compliance, attendance and achievement of program goals. Each participant also received a $25 gift card at the grocery store session and a $25 gift card at the final session. Twenty-four children were not given pedometers. Twenty-five children were given a pedometer and instructions to wear the pedometer every day for the entirety of the program. Fifty-six children were given a pedometer, instructions to wear the pedometer every day for the entirety of the program, plus individualized step goals (a 500-step increase each week above baseline). Baseline step-count data were gathered during week 1, which means that the goal for the children in this group was to increase their step counts by 4,500 steps over the course of weeks 2 through 9. Importantly, the cohorts were scheduled throughout the year to control for seasonal effects. 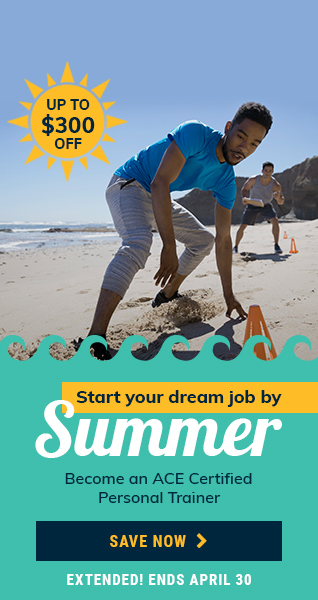 Specifically, the two no-pedometer cohorts participated during the summer and fall, the two pedometer cohorts participated during the winter and spring, and the four pedometer-plus-goals cohorts participated in each of the four seasons. A series of measurements were taken during session 1 and at specified times during the study. Height was measured during sessions 1 and 10, while weight was measured at the beginning of each session (excluding the off-site sessions). These values were used to calculate BMI before and after the intervention. For the groups that used a pedometer, the physical-activity data, including daily steps, were downloaded from the pedometer during weekly sessions. Finally, the researchers used a psychosocial questionnaire to assess quality of life, subjective health and enjoyment of physical activity. This was done before and after the intervention. Overall, the mean weight change was +0.02 kg, the mean BMI change was –0.20 kg/m2 and the mean BMI z-score change was –0.02. BMI z-score is used for children and adolescents. Percentages are used, and then values assigned, to classify individuals as having overweight or obesity. For example, a BMI z-score of 2.5 indicates a BMI above the 99th percentile, while a z-score of 0.0 indicates the 50th percentile. Participants who received a pedometer plus step goals had a significantly greater reduction in weight, BMI and BMI z-score compared to those not given a pedometer (Table 2). The average change in the number of daily steps for participants who received a pedometer plus step goals was 1,185 ± 425, while those who received a pedometer but no goals saw an average change of –162 ± 620 daily steps. The children who received step goals had significantly higher daily step totals every week during the intervention, but still fell short of the overall goal of increasing their step totals by 4,500 per day by the end of the nine weeks. The two groups that used a pedometer during the weight-management intervention experienced a significant increase in subjective health and health-related quality of life, but no change in enjoyment of physical activity. There was no difference between the two groups (i.e., those with or without goals) for these three factors. The key takeaway from this research, according to Dr. Staiano, is that wearable activity trackers are only effective if the wearer is working toward an individualized step goal. The individualized nature of the goals used is something to highlight, as commonly cited goals such as 7,000 or 10,000 steps per day may represent targets that are too high for many populations, including youth with obesity. Instead, the researchers gave each child a specific goal based on his or her baseline step total, which was recorded during week 1. Importantly, accountability and support were built into the weight-management intervention. Incremental goals (e.g., the 500-step weekly increase used in this study) are not only less intimidating, but also provide an interesting opportunity for health coaches and exercise professionals. One potential reason why children fell short of the overall goal of increasing daily step counts by 4,500 was that the researchers were limited to weekly check-ins. Health coaches and exercise professionals can implement a daily check-in system to keep their clients on track. Some trackers and phone apps will even allow the coach or professional to monitor clients’ steps in real time. In addition, many clients may not know how to set an effective goal for themselves, which is another opportunity for the health coach or exercise professional to lend support. In terms of weight management, the degree of weight loss was very small, but keep in mind that for many of the participants in this study halting weight gain is a sign of notable success. The American Council on Exercise and ACE Certified Professionals often have an eye toward health equity in their work. Health equity means that everyone has a fair and just opportunity to be healthier, which requires access to good jobs, homes and schools, as well as ongoing efforts to increase opportunities for everyone—particularly those who face the greatest obstacles—to live happy and healthy lifestyles. Two-thirds of the participants in this study were minorities and two-thirds were on Medicaid. A desire to reach underserved populations is one reason why the research team chose low-cost pedometers and extended invitations to participants’ families to attend sessions. Barlow, S.E. and Expert Committee (2007). Expert committee recommendations regarding the prevention, assessment, and treatment of child and adolescent overweight and obesity: Summary report. Pediatrics, 120 (Suppl. 4), S164–S192. Flodmark, C.E. (2016). 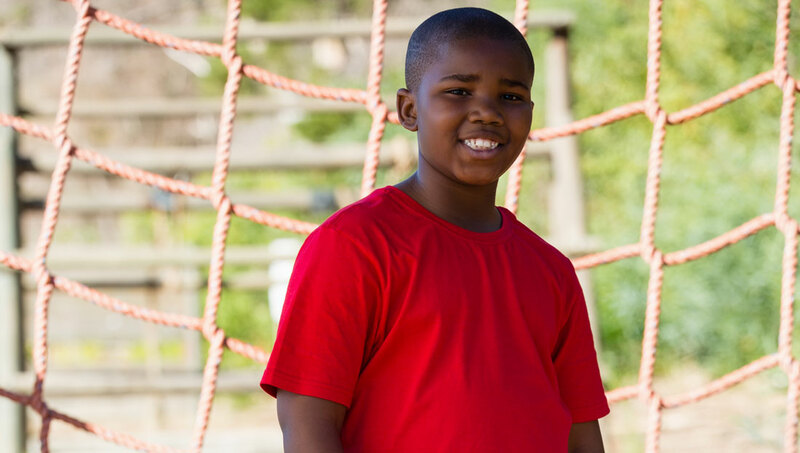 What’s new in childhood obesity and what do we still need to establish? Acta Pediatrica, 105, 1116–1118. Kist, C. et al. (2016). Physical activity in clinical pediatric weight management programs: Current practices and recommendations. Clinical Pediatrics, 55, 1219–1229. Ogden, C.L. et al. (2016). Trends in obesity prevalence among children and adolescents in the United States, 1988–1994 through 2013–2014. Journal of the American Medical Association, 3, 315, 2292–2299. U.S. Preventive Services Task Force (2010). Screening for obesity in children and adolescents: U.S. Preventive Services Task Force recommendation statement. Pediatrics, 125, 361–367. 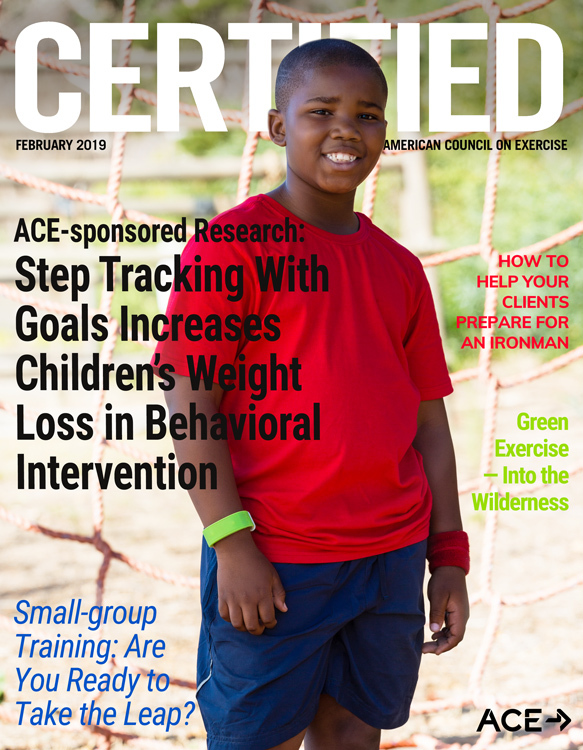 This study, which was cosponsored by the American Council on Exercise, was originally published in the peer-reviewed journal Childhood Obesity. What percentage of American children are affected by obesity? The key takeaway from this research is that wearable activity trackers are only effective if the wearer is _________________________.